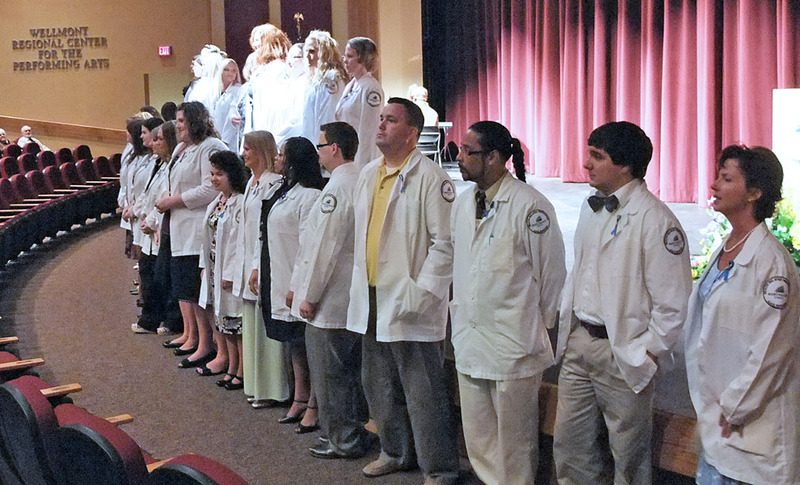 Northeast State Community College recognized its third class of Nursing graduates at the 2011 Pinning Ceremony held Monday night at the Wellmont Regional Center for the Performing Arts. 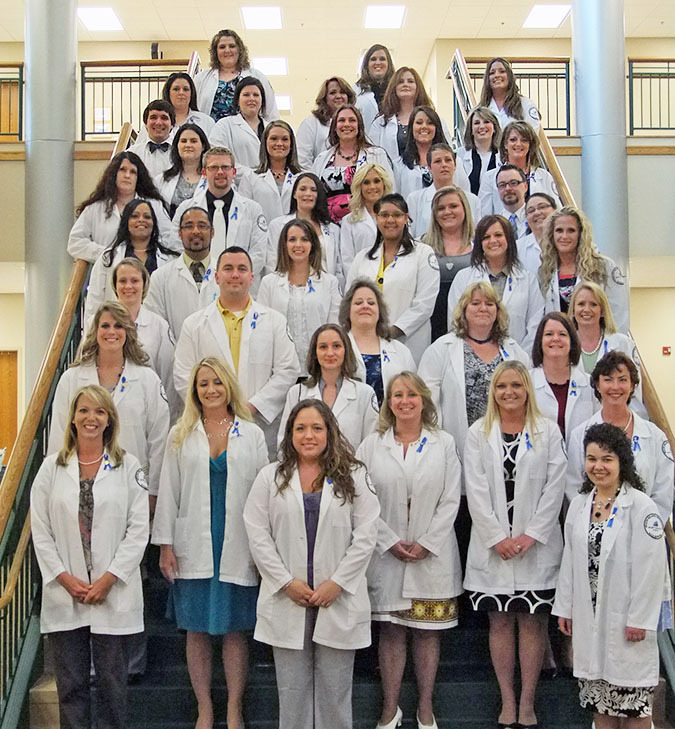 The 2011 class of Northeast State nurses. In the dean’s charge to the graduates, Nursing Dean Dr. Melessia Webb contrasted the abilities of champions and leaders. She challenged graduates to extend themselves and become leaders in the profession of nursing. Northeast State Nursing graduates for 2011 are: Heidi Bacon, Amber Ball, Amanda Begley, Geri Bennett, Jessica Bowers, Robin Branum, Lisa Brummitte, Sara Campbell, Alicia Catron, Cynthia Clawson, Rachel Coleman, Amy Crawford, Christopher Dalby, Chris Dickson, Lori Dotson, Kelly Eidson, Courtney Faulkenberry, Yvonne Fields, Elizabeth Fields, Scotty Fletcher, Ne’Ermanyah Garcia, Jayme Gregory, Tara Higgins, Carrie Holder, Leslie Houghton, Susan Jackson, Erica Jones, Timothy Kaney, Angela Keith, Melissa Lovin, Felicia McConnell, Seth McLaughlin, Rhonda Meade, Jamee Peay, Morgan Pecktol, Lyndsey Ratliff, Stacey Robinson, Lindsey Rompa, Jodi Shaffer, Penny Simcox, Kristie Smith, Judith Williamson, and Lindsey Woodlief. Guest speaker and nurse Kathryn Visneski advised her future colleagues to always be present mentally and emotionally with their patients. She also reminded students that providing care also extended to them personally as they entered the rewarding but stressful world of nursing. Nursing grads recite the Nightingale Pledge. The pinning ceremony provides a symbolic welcoming of new nurses into the profession. 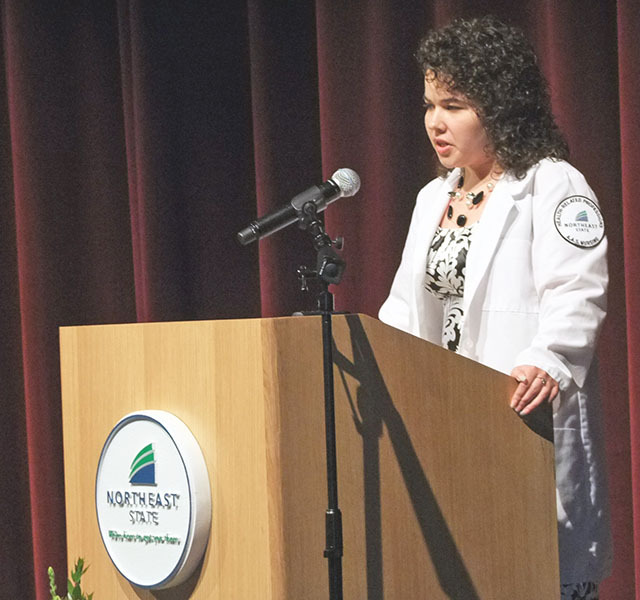 Each graduating student received a Northeast State Nursing pin on his or her white lab coat signifying completion of the 65-hour associate of applied science degree program. McLaughlin won the Nursing program award as the class’s top student. He along with Keith and Woodlief will graduate with perfect 4.0 grade point averages. Garcia was named Adult Learner of the Year. Lindsey Woodlief delivers the students' answer to the dean's charge. These students will graduate at the College’s spring commencement scheduled for 7 p.m. tonight at Memorial Center on the campus of East Tennessee State University.